Nick has been a patient in our office for many years. From the very first day we met, we discussed when the timing was right; he wanted to change his smile. Nick was unhappy with his short teeth, multiple spaces between all of his teeth and the overall color. In addition, we know a great smile can help with professional advancement. 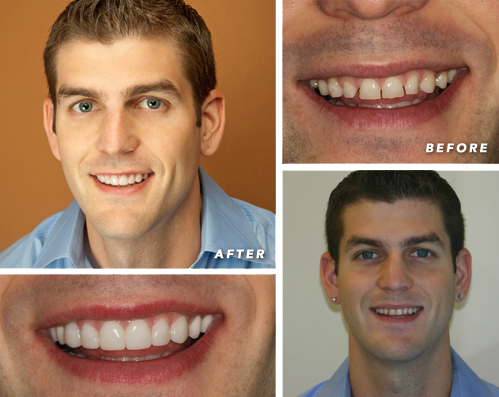 Nick is very successful at his job and we were happy to help him transform his smile. We reviewed several treatment options including orthodontics, traditional veneers/crowns, and Lumineer no preparation veneers. Nick liked the idea of minimal work on his teeth and we preceded with a combination treatment of Lumineers and all porcelain crowns. Lumineers can often place limits on the changes we are able to make in a smile, but in Nick's case it was a homerun. The final results were what he asked for and he looks fantastic. Ever since I was a little kid, I have had problems with my teeth and have always been self conscious with my teeth and their appearance. When I was younger, my brother and I were playing tag in our basement and I happened to fall and hit my front teeth on the stairs. Through the years, I have had to wear mouth guards, corrective biting apparatuses, and braces a few times. Needless to say, I have been struggling to fix my teeth for the last 12 years of my life. When I came to you for normal cleaning and when you recommended veneers, I welcomed it with open arms. After getting my veneers, I have hot what seems like thousands of compliments on how nice my new smile looks and my personal confidence has went up. I now love to smile and laugh and I am never self conscious about my teeth anymore. I have always felt comfortable with yourself and your staff and have always been treated like I was part of a family, and never as a "patient." I love the professionalism that your office brings to the table and the expertise that you have brought as well. I have always been greeted with warm smiles, friendly staff, and even cookies! I will strongly recommend anyone that I come across that I think could use your help. Thank you so much for all that you have done for me!